Ghost stories require a suspension of disbelief, at least from those without serious superstitions. A Ghost Story requires something more. All but daring its audience to chortle, David Lowery’s supernatural mood piece unfolds almost entirely from the perspective of an apparition straight out of a grade-school fun house: a billowing white bed sheet with two holes cut into it for eyes. On some level, this was probably a budgetary workaround, and maybe a shrewd one; as the piss-poor CGI of Personal Shopper recently demonstrated, it takes some coin to conjure a convincing specter from 1s and 0s. But get on the wavelength of this mesmerizing, singularly unusual genre experiment and the undead being at its center stops looking so silly. There’s life in the dead darkness of those eyeholes: black reflective pools on a pale expanse of linen, conveying more feeling than you might expect. Knowing there’s a person under there helps. Has Casey Affleck found a new way to make inexpressiveness expressive, to scrawl emotion across a blank slate? Or is that just the memory of Manchester By The Sea, another ghost story of sorts, glowing faintly through the fabric? We meet Affleck’s character as a man, alive but unnamed, composing sad-sack indie electronica in the cozy residential space he shares with his wife or maybe girlfriend, also unnamed and played by Rooney Mara. Reuniting the romantic leads of his Texas outlaw saga Ain’t Them Bodies Saints, Lowery offers flashes and whispers of domestic communion: sinking into the comfortable embrace of long-term cohabitation, mulling a move, awakening to strange sounds coming from the living room. Does something spooky lurk in the couple’s digs? Could that be one reason she wants to leave the house to which he’s become attached? These lovers have barely taken shape when A Ghost Story makes its left turn into the unknown, beginning with a slow pan across suburbia at dawn, landing on the aftermath of a car crash that’s left Affleck’s bearded musician lifeless at the wheel. Minutes later, in a scene any given horror movie would play for less wonder and more dread, the dead man rises from the cold surface of a hospital slab, looking suddenly like a child’s scribbled conception of what goes bump in the night. Gusting across a vast, verdant field—an image of blinding beauty, and far from the movie’s only one—the spirit is drawn back to his home, where he bears silent witness to the mourning process, caught in his beloved’s orbit like an invisible satellite. The years tick off, but the ghost stays planted, the environment changing around him, time passing as it does for the living—at an agonizing crawl at first, in the blink of an eye eventually. Occasionally, he makes the lights flicker or the china shatter. Mostly, he lingers. 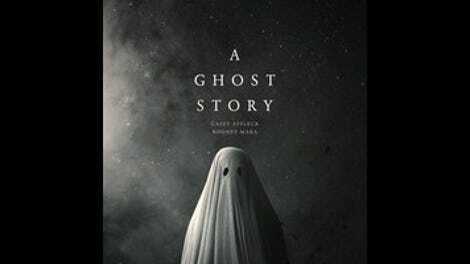 Shot on a limited budget over a few days, and in the boxy Academy ratio (only with the edges of the frame rounded off, supplying every image an almost home-movie intimacy), A Ghost Story defies easy classification. You could describe it as a haunted house movie from the point-of-view of the haunter—one scene could come straight from Poltergeist—but that might lead people to expect horror, when raising hairs isn’t really on the agenda. This is a film with long stretches of deathly quiet, where the camera will adopt a somnambulistic stasis. 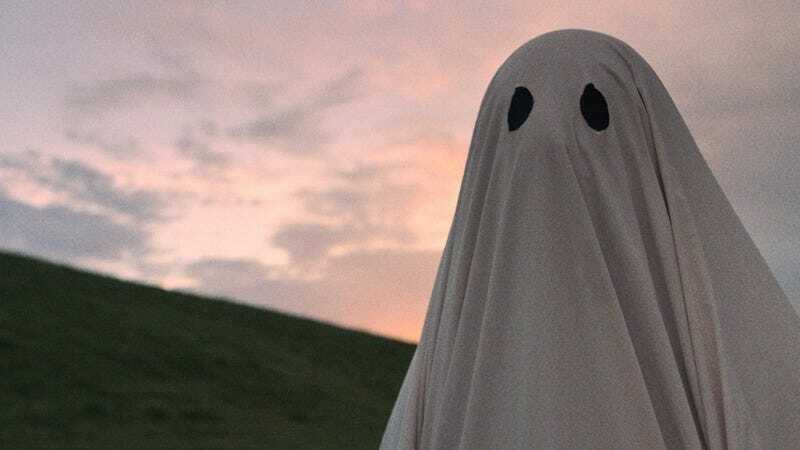 At the same time, Lowery treats his scenario with a certain playfulness; the cliché childhood image of the ghost itself has a plain comic appeal, and there are moments, like the subtitled dialogue between our ethereal hero and another ghost across the street, that seem caught between whimsical humor and an existential melancholy. For the writer-director, A Ghost Story is a return to micro-indie roots after a soulful detour to Disney for Pete’s Dragon. And yet it would be hard to call a movie with this much reach “small,” especially once it starts stretching forward and backward through time, the canvas expanding to cosmic proportions. There are those who will find A Ghost Story boring, silly, or just hopelessly pretentious. Late in the movie, after a good hour of wordless action, an amateur philosopher drops some truth bombs on a party full of college kids, too-neatly encapsulating some of Lowery’s themes. To the detractors, this whole languid curiosity of a film may feel like chasing a stoner’s train of thought. But there’s a joke to the scene, too, and it’s that there’s a literal celestial being among the man’s audience—a ghost listening to him prattle on about an eternity he can’t possibly comprehend. By its final passage, when the film has doubled back on itself through sci-fi curvatures, A Ghost Story practically glows with mystery and possibility, pushing through the outer limits of its storytelling constraints as it meditates on legacy, romantic connection, time itself, and the value we place on the spaces we occupy. That it does all that while also encouraging us to identify with a glorified Halloween costume is only further evidence of its enormous ambition. Cynicism, along with disbelief, is not so hard to suspend.